Our new study on the consequences of gun violence in six states has gotten a lot of attention for its findings about the cost of hospital care and who pays for it. And with good reason—the financial costs of gun violence are enormous. In 2010, national costs totaled nearly $670 million, most of which is paid for by the public, either through public insurance programs like Medicaid or through the public subsidy of uncompensated care costs for the uninsured. But our report touches on far more than just money. Our research also revealed new information about the victims of firearm assault who sought care at a hospital, including the range of hospital mortality rates and disparities across race, ethnicity, and gender. These factors may not be attached to an imposing price tag, but their societal costs are just as significant. 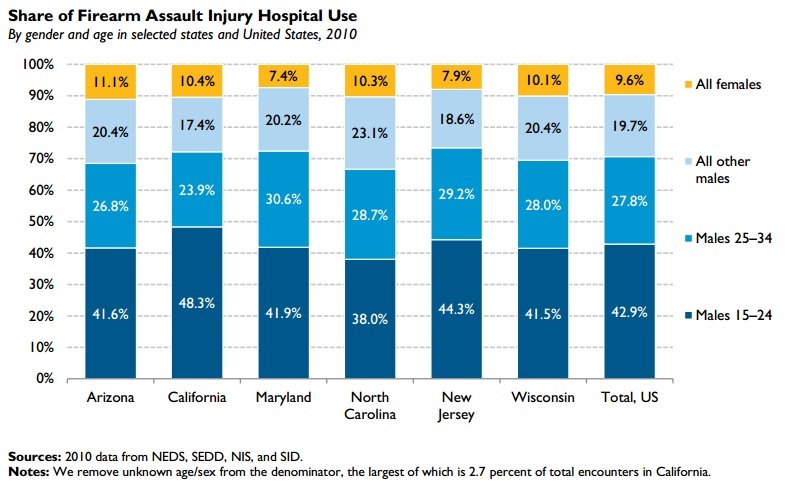 In all of the states we examined, the vast majority of firearm-assault-injury hospital patients were male. Boys and young men between the ages of 15 and 24 composed the largest share. Men ages 25 to 34 were the second-largest share, and males of all other ages came in third. Of all firearm-assault victims, girls and women of all ages compose a comparatively small share of hospital use, ranging from 7.4 percent in Maryland to 11.1 percent in Arizona. The gender disparities are stark, but the racial disparities are even more glaring. Among young people ages 15 to 34, black boys and men are much more likely to come to the hospital with a firearm assault injury, with rates up to 7.2 times higher than the next-highest category, Hispanic males. Similarly, black females have a higher hospital-use rate than either white or Hispanic females. In every state except Arizona, black females also have a higher rate than white males. Such concentrated violence can have a destabilizing effect not only on the victims, but also on their communities, and this victimization, disproportionately concentrated among men and women of color, should serve as a clear call to action to find new solutions to gun violence. If you’re shot in North Carolina and make it to a hospital for treatment, your chances of survival are higher than any of the other five states we studied. In contrast, Maryland’s mortality rate for those who arrive at the hospital—15.6 percent—is more than double the national rate of 6.5 percent. Mortality rates can’t be pinned on one factor—for instance, in the case of North Carolina, victims with severe injuries may not survive the longer trip to the hospital— but it appears that having health insurance does play a role. In five of the six states, uninsured victims of firearm assault have higher mortality rates than those with some form of insurance. Nationally, both publically and privately insured firearm assault victims have about the same mortality rate (about 5 percent), more 3 percentage points below the uninsured mortality rate (8.4 percent). First, if initiatives to help young men, like President Obama’s My Brother’s Keeper, are to succeed, we need to take the initiative to protect young men and especially young men of color from gun violence. Programs like Cure Violence can help reduce violence in neighborhoods where shootings and other assaults frequently occur, while juvenile justice research can devise new ways to divert youth from both crime and the criminal justice system. Second, we need more research to determine why the uninsured die from firearm wounds at higher rates than the insured. Identifying why being uninsured is linked to higher mortality rates would be vital intelligence for improving hospital care and reducing gun deaths. Gun violence imposes disproportionately high tolls on the communities least able to bear those harms. By identifying those groups and the burdens they face, we can begin to create strategies for reducing the harms of gun violence. These efforts could save and enhance lives, and yes, ultimately reduce taxpayer costs. There is no such thing as gun violence, any more than there is automobile or swimming pool or slip and fall violence. There are only violent people who commit crimes with guns. I think it's interesting that the 3 states with the highest mortalist are the ones with the most restrictive laws to limit access to firearms. "More Guns, Less crime" is accurate. Also, no mention of illegal drugs and gang participation was made - these 2 things are the primary cause of violence for the age group of 15-24 yr old males. In addition to gun violence, it would be interesting to see what the other methods were used. Also, while it would be impossible to quantify, the medical costs avoided by having citizens armed (particulary with concealed weapons) would have the cost in these studies beat by a mile!